Update, July 4: The Fallout 76 rendition of ‘Take Me Home, Country Roads’ is now on iTunes. Fallout 76’s cover of the John Denver classic ‘Take Me Home, Country Roads’ got a lot of play back at E3, especially at the PCGamesN offices, with the trailer playing on near constant loop here. Now we don’t have to suffer annoying details like gameplay footage every time we want to hear it, because this version of the song is now live on iTunes. The Fallouts stand among the best RPGs on PC. Grab it yourself at the iTunes store. The dangerously catchy song has been named a state anthem by West Virginia, which it wistfully namechecks, making it the perfect match for Fallout 76’s setting. Fans have been trying in vain to work out exactly which cover of the song featured in Fallout’s reveal. The iTunes listing credits the cover to Copilot Music, an organization which specializes in music to accompany trailers – including Bethesda games like Wolfenstein II, Doom, and Fallout 4. It’s certainly got in our heads – here’severy cover of ‘Country Roads’ you don’t need. And, if you’re more inclined toward the game than the music, be sure to check in on the Fallout 76 release date and all the info we currently have about the game. Bethesda has pledged a minimum donation of $100,000 regardless of sales once Fallout 76’s take on ‘Country Roads’ hits the iTunes store on July 4th. The music played in the first look at any Fallout game tends to stick in the head: think Dion’s ‘The Wanderer’ from Fallout 4, and ‘I Don’t Want To Set The World On Fire’ from Fallout 3 – another Ink Spots classic that was actually Black Isle’s first choice for the original game. 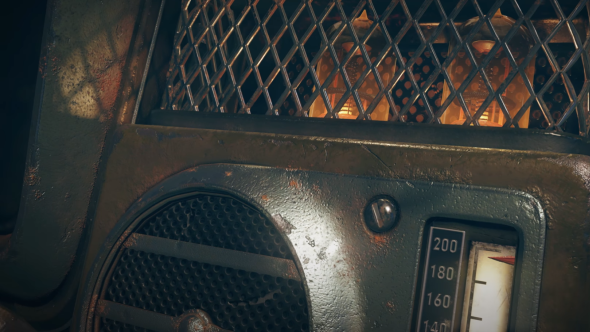 In fact, you can hear the opening chords of ‘Set The World On Fire’ as the radio kicks in during Fallout 76’s trailer – the bulbs flickering just as they did in Fallout 3’s first teaser. It’s all connected, man.